Mauricio Pochettino has confirmed 21-year-old Kyle Walker-Peters will start in Tottenham's crucial Champions League match at Barcelona on Tuesday due to selection problems at right-back. Spurs announced on Monday that Walker-Peters, an academy product, had signed a new contract to keep him there until 2023. The news came after Walker-Peters made his first Premier League appearance of the season in Saturday's 2-0 win over Leicester City. He replaced the injured Serge Aurier, who joined Kieran Trippier in the treatment room – the England international suffering with a groin problem. 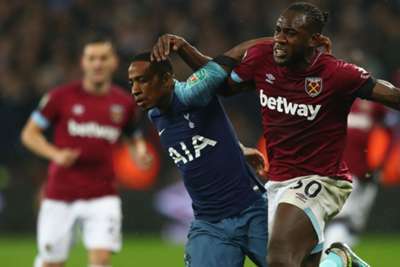 Pochettino has no doubts about Walker-Peters' abilities, however, even if he is set to be thrown into the deep end with Spurs needing to leave Camp Nou having matched Inter's result at home to PSV. "I think Kyle Walker-Peters has the option to play," Pochettino told reporters in his pre-match news conference. "I want to remind you that 18 months ago he won the Under-20 World Cup in [South] Korea and his quality is unbelievable. "Young players always need the trust and need to play and to play in a difficult place like the Nou Camp will make him stronger than before. We don't have doubts that he can perform. "I'm so happy to have three very good players in this position with different qualities. I think Kyle has the qualities to play. "He needs to feel free. He's a very relaxed player and person. Whatever happens [against Barca], we hope he will be a massive success for this club." Barca, who are already assured of top spot in the group, are unlikely to use Luis Suarez despite being named in the squad as he continues to make his way back from a knee injury, and Pochettino recognises that is a boost to Spurs' chances. "It's a big loss [for Barca] because he's one of the best strikers in the world, along with [Harry] Kane," Pochettino said. "It's a shame he cannot be here. He showed his quality in different countries and now at Barca, so it's an important loss for them."